Leaves are a perennial favorite for quilt blocks among quilters – autumnal leaves, Christmas holly, hosta leaves and many others all make great quilt blocks or small quilts. 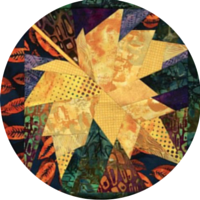 This 2 day leaf design class introduces Ruth McDowell’s approach to translating a photograph into a sewable quilt design. Your leaf block design will be ideal for a small wallhanging, a table runner or as a block design for a larger quilt. We start this process with a good old fashioned leaf collection! I head out into my neighborhood and pick as many different kinds of leaves as I can. With leaf in hand, I now can then make photocopies copies of an actual leaf. Flatten each leaf by placing it between pieces of wax paper (the waxy side facing toward the leaf), then cover with a sheet of paper (a brown paper bag works well) and then press with a cool iron. I also put paper on my ironing board so I don’t’ melt any wax on it! Ironing a leaf this way will flatten and dry it out. You can then easily photocopy the leaf and enlarge it 200-400%. Bring to class enlarged photocopies or photo prints of several different leaves. These images should be 11 x17” or 12”x18” enlargements. This will allow you to make create a full sized design directly from the image. We will discuss the pros/cons of each leaf form and the various options for creating a block design. I will also have a variety of leaf photos to discuss in class. Your own photos are the best source of images for quilts. Your direct connections to the photos you’ve taken make them memorable. You may also find photos by friends or family a good source; use them only with the permission of the owner or photographer. Its important to remember that the endless images available on the internet were each taken by someone, and in nearly every instance the photographers do not intend or explicitly do not allow you to use them without their permission. The vast majority of photos, even on sites like Flickr, are copyright protected. The same is true for all forms of print media. These too are copyrighted images. It’s important to respect copyright rules. If you don’t see explicit permission (noted as copyright free, royalty-free) posted with a photo or on a website, assume you can’t use it. There are a few internet sites that post images in a “creative commons”. In these instances, the photographer has posted a photograph to allow others to use it for any purpose, copyright-free and royalty-free. If I am searching for inspiration or for a particular kind of image, I stick to “creative commons” websites or websites containing photographs that are in the public domain and check their rules carefully before downloading images. Respect the rules; you are required to seek written permission from the photographer if you are considering using an image. It is illegal to do otherwise. Pattern: To design you own leaf pattern, bring to class your photocopy enlargements of several different kinds of leaves. Fabrics: You will see that my patterns combine a wide selection of fabrics that enhance the look of the quilt. The image (such as a chicken, flower or bird) will use anywhere from 6-15 different fabrics, mostly in small pieces. Some fabrics will be repeated in the quilt, others may appear only once. The backgrounds will also typically feature 3-6 different fabrics that have a similar look. In some instances we will be looking for specific features in a patterned fabric — for example something that suggests the shape of an eye, or feathers, or fur or a stem. Patterned fabrics with multiple colors add texture and dimension to the quilt. We will be playing with different combinations to see how these fabrics look next to each other. Having lots of patterned fabric choices from which to choose is part of the creative process for these quilts and helps bring these designs to life. Its the seemingly odd combinations of fabrics that bring texture and depth to your quilts, and will work well. Depending on your design, you may or may not reach the point of beginning to sew your design together. Most students will be completing fabric selections and begin sewing by the end of the workshop. Leave your machine in your car initially. You should be comfortable using your machine. Check to be sure that it is in good working order. Using the camera on your phone or tablet will work as well.